This is a totally unusual quartz from Madagascar and supposed to be amethyst, but try as I might, all I can see is her light and zoned smoky color. She is a DT, but both terminations are chlorite eroded and very rugged and ancient-looking ... all but one partial face is eroded. 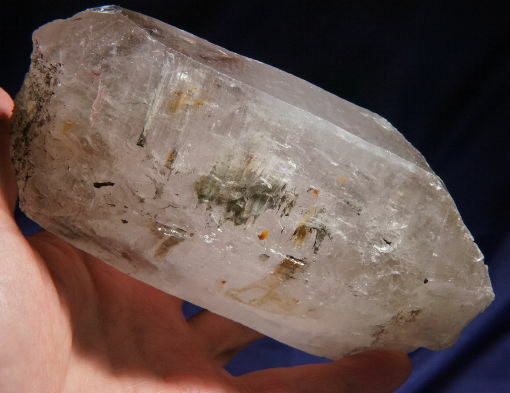 The sides have rather profound Lemurian lines. And wow, wait until you see her enhydros ... I have to say that with her internal misting, it was very hard to capture them with the camera but there is one large one that moves in a huge bubble chamber and one smaller one! Both are very visible and zippy and the largest is easily 0.75 across! The huge bubble chamber that allows excellent movement to the bubble and you get so entranced, you almost miss the other! One side is clearer than the other and it's easier to see the bubble. I love the luminous quality to her and she almost gives the appearance of having a phantom ... truly amazing and wonderful! She is 1 lb 9.2 oz and 5.4 by 2.6 by 2 and has a few dings (the largest one has healed) that do nothing to effect her wondrous energy or ancient presence. This Spirit has a very ancient feel to her and in fact, when you think of the water inside her, it blows my mind to know that it's millions of years old! Enhydros are a bit of a misnomer ... the bubble isn.t actually water ... it's air inside the water and when you study this Spirit, it's pretty easy to see. Water, air, fire (smoke) and Earth (the crystal and the bit of matrix) ... they are all present in perfect balance. This is a Spirit for a Keeper who is struggling with all the Spiritual development and integrating same into physical expression. One seems to get away from the other and the Keeper is either too grounded (and lethargic and without energy) or flighty and rather light-headed. She will help you understand the importance of balance and gently assist in the achievement of that balance. She is a splendid Spirit and certainly one of a kind!